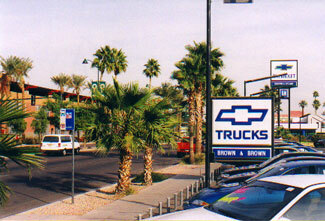 Mayor Wayne Brown’s brother of Brown & Brown Chevrolet in downtown Mesa, got a big chunk of land across from their existing dealership while displacing hundreds of poor residents, besides getting the prime chunk of property downtown for $1.00 , across from their existing dealership to the right in the picture. Behind the big sign is their existing building that was totally remodeled, and the parking lot was refinished. “So what,” you say? In the City of Mesa, for all the “not-so-privileged” citizens, when a business does a remodel of an existing building, or even if you resurface your parking lot in the City of Mesa, that business must do the following, ... ... none of which was ever done. 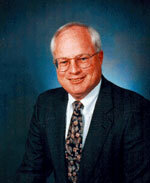 Water retention is a must to a certain percentage of your property. They did not even provide any spaces for parking! Please, someone tell us, What benefit to the downtown area is this property the city council gave to Brown & Brown? Brown and Brown employees are parking on the public streets. The dealership draws no big crowds to downtown that will ever benefit downtown merchants. Brown and Brown buildings are about 10feet from Main St. Did they need all this big sinage! Why couldn’t Mr. Brown have built that building on his existing property? Why did Mr. Brown take the thousands of dollars raised for the displaced families on the property which he got for a dollar, and end up not giving a dime to one victim of this land-scam. Add all that to the list as well. As for the "Henry" giveaway, had Brown and Brown left Mesa, which he wouldn't have, someone would have scarffed up that Chevy franchise in a heart beat. 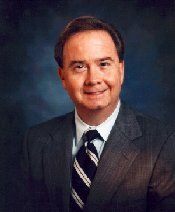 I have also noticed lately that the good Mormons installed a new traffic light, at taxpayers expense, so his salespeople could get across the street to his storage garage, to get a traffic signal anywhere else, it takes a few deaths, it takes hundreds of signatures on a petition, and a thousand dollar study before you can get one installed in the city of Mesa. I’ll bet that the new Wal-Mart at Stapley and Baseline produces more sales tax income in one week, than down town will produce in a lifetime, and this store didn't cost taxpayers one red cent. Since the good Mormons in Mesa passed the no smoking law in restaurants, I no longer patronize any Mesa businesses, I give my sales tax money to Gilbert, Chandler , and Tempe. 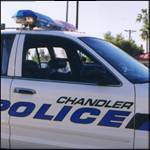 I recently purchased a newer car, in Chandler, they were thrilled to have my hundreds of dollars in Sales tax. Furniture Connection, located on the S.E.corner of Greenfield and Main Street, moved into this building that was once Olie’s Lumber store. Olie’s was closed for well over 2 years. This is approximately a 35,000 square foot building. In the city of Mesa for all other “not-so-privileged” citizens the law reads that, if the building is abandoned for more than one year. ALL the existing signs must be taken down and they must conform to all the new sign codes. I personally know this, because in 1993 I leased this building. After spending thousands in renovations and about $18,000 to a lawyer to fight the City so I could keep the sign. 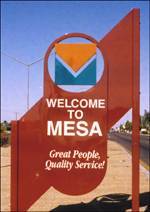 The City of Mesa said I must take down the sign you see in the photo, that if the City let me keep the existing sign, others would want the same. The building was useless without the sign, because the building is set way back from the road. 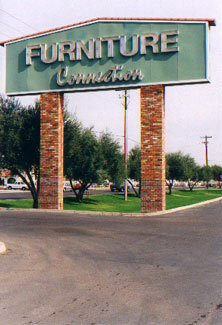 Six months later Furniture Connection opened, with the existing sign structure. 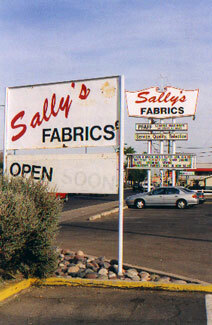 Sally’s Signs ...How did they get away with it? We know how they got away with it! The Excell property is located on the N.W.corner of Gilbert and Main Street. Owned by Eldon Cooley, ..ex-mayor for the City of Mesa and long time buddy of Charlie K. Luster, and as well connected as they come. 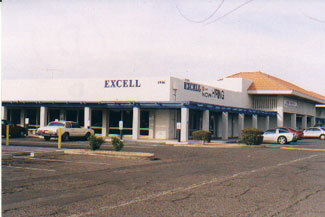 After Shoppers World was forced out by the City of Mormon, the building was immediately leased to the Excell company for a much higher rental rate. 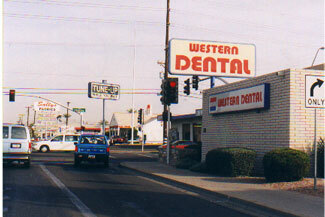 Dental World located on the SW corner of Main St. and Stapley. Can’t figure out their connection to the City yet? This building was closed for over a year, and there was a change of use, ..Talk about over signage!